Blurb Description: How is it that you suddenly notice a person? How is it that one day Digby was my best friend's admittedly cute twin brother, and then the next he stole air, gave jitters, twisted my insides up? Chris from The Body by Stephen King. That horrible lunch lady stole the milk money, not Chris! NOT CHRIS! I’ve been upset about that since I read the book when I was twelve. Because everyone knows at some point what it’s like to want someone you can’t have or shouldn’t have, or someone who doesn’t want you back, and don’t you want to go through it all again? Also, everyone has a moment when they realize the adults in the world are winging it. This is both liberating and exciting and it’s exactly where Lucille stands at the beginning of this book. You know I never talk about this, but I had a dream about a redhead named Digby and remembered it when I woke up. It’s so hokey-sounding but it’s true. And then Lucille was always Lucille and Wren was always Wren. I can’t imagine them being named anything else. I once had an editor tell me the names were old-fashioned and my response was, well that’s what their names are. Sorry! You don’t have to be the same kind of grown-ups as your neighbors. You can define adulthood how you want to, and if you don’t want to be together anymore, that’s okay. You, Tony, don’t have to wear a suit and kill yourself to measure up to an idea you have of what being a father means. And you, Laura, can face one day at a time, put one foot in front of the other, and one day you’ll find a new love and things won’t be so overwhelming. The world does not begin and end with the love of a man. Your children should be the loves of your life. And by the way, you guys have a whole community of people waiting to help you. Maybe that isn’t good advice. Maybe things turned out exactly how they were supposed to. “So I hope he never does kiss me. That would be nothing but a disaster. No one needs to see me fall apart like that. Least of all him. When is it the right time to fall in love? When it's nearing Valentine’s Day, or prom, or New Years? How about when it's two a.m. and you feel like you have no one in your corner? When is it the right time to meet The One? It is when you're in high school, in college or after college? When? You might think you have a plan - a plan that the universe will help you follow through - but what if it doesn't work out that way? What if everything happens at the wrong time? Everything good and everything bad, all at exactly the time you don't need it to happen. Because that's love, and that's life. Messy, unpredictable, crazy. If only Lucille's mother didn't leave just as she was finishing school, leaving her to take care of her nine year old sister. Why couldn't she have waited until later, when both her daughters were grown up? Why did her father have to do crazy? Why did life have to go from simply having a crush on a forbidden boy, to power and sanitation bills, working seven hour days and lying to adults at all costs? Why did the boy she has been crushing on choose now to look at her for the first time? 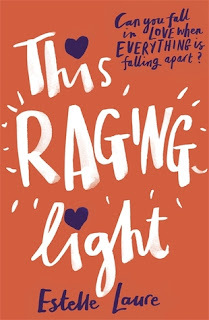 When I initially read the premise of This Raging Light, I didn't think it would pack an emotional kick of any kind that a book with this kind of premise requires. The book I got, however, was grittier and just better than the one I expected to get. In all honesty, This Raging Light surprised me. I admired the protagonists character and determination, I admired that she was willing to go through days that would tire out a hardworking adult, let alone a teenage girl with school to get to and a house and a sister to take care of. It was an impossible situation, and I was SO glad that this book consisted of things actually getting done, and very little complaining. I loved the relationship between Digby and Lucille – especially how the whole feeling of love was described for the first time. What I didn't like was well, her parents (obviously). And geez. I get that life is hard, but whether it was entirely your decision then or not, you're responsible for the children you brought into this world and you don't run away and/ or sit at halfway houses claiming life is too hard and all you really need is a beer when your seventeen year old daughter slaves it out, doing what the two of you should have been doing. It doesn't work that way. Grow up. Also, Eden. I loved the idea of her as a best friend, but the plot twist that was used to get Lucille and Digby close together, by just kicking the best friend off the picture, was a little too Boyfriends over Friends to me, and I just don't stand for that thing. All in all though, This Raging Light was a whole lot better than I expected, but not everything it could have been. 3.75 stars! It's really hard to choose my favorite contemporary read since I love that genre and picking a fave is such a chore LOL but right now, it would be You and Me and Him by Kris Dinnison :) Thanks for the giveaway!